Blokium 50 mg: Tablets: Box of 30. Blokium 100 mg: Tablets: Box of 30. 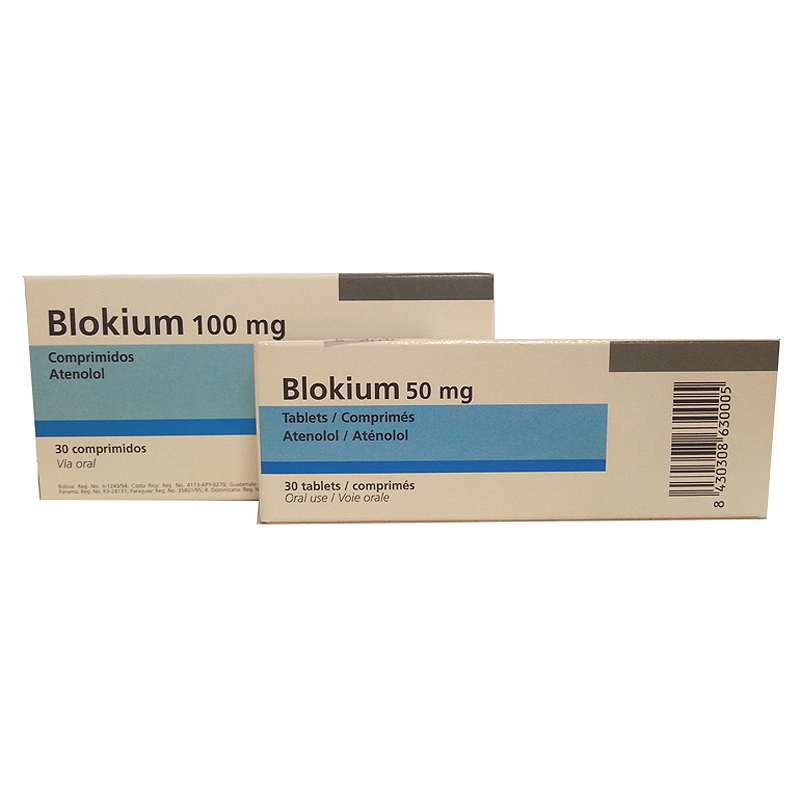 Blokium 50 mg: Each tablet contains: Atenolol: 50 mg. Excipients: microcrystalline cellulose, croscarmellose sodium, magnesium stearate, talc, colloidal silica, sodium lauryl sulphate. Blokium 100 mg: Each tablet contains: Atenolol: 100 mg. Excipients: microcrystalline cellulose, croscarmellose sodium, magnesium stearate, talc, colloidal silica, sodium lauryl sulphate. Atenolol is a β-adrenoreceptor blocker acting primarily on the cardiac β-1 receptors. The product has no intrinsic sympathomimetic activity or membrane stabilizing properties. Atenolol does not go through the hematoencephalic barrier. Because of its simple dosage pattern and prompt response, Blokium constitutes an effective medication, above all in antihypertensive therapy, and is well tolerated by the patient. Blokium can be administered concomitantly with diuretics and other hypotensive agents. Treatment of essential hypertension; angina pectoris; cardiac arrhythmias. Heart block of second or third degree. Cardiogenic shock. Do not administer during pregnancy or nursing period unless strictly necessary. In patients with heart ischemic disease, treatment must not be suddenly interrupted. A reduction of heart rate to 45 beats/minute or below is indicative of the fact that the dose should be reduced or medication withdrawn. The anaesthetist should be made aware of Atenolol therapy in patients due to undergo general anaesthesia. Atenolol should not be given with verapamil. Treatment with either of these drugs may not begin until 7 days have elapsed since the withdrawal of the other. Atenolol should be associated with caution with class I antiarrhythmic drugs such as disopyramide. Reserpine may have an additive effect when given with beta-blockers. In combined treatments the patient should be monitored to prevent hypotension or excessive bradycardia. If treatment is started in combination with clonidine, treatment with this drug should be continued until several days after discontinuing administration of Atenolol. In all combined treatments, the possibility of raising the bradycardial affect should be taken into consideration. Atenolol crosses the placental barrier. Concentrations in breast milk are approximately three times plasma concentrations. It has been used to treat hypertension during pregnancy (generally after the 20th week) without any evidence of foetal malformations. No adverse effects during breast feeding have been described. The possibility of harmful effects on the foetus cannot be entirely excluded. It should therefore only be used in pregnancy or lactation if, according to the doctor’s strict criterion, the benefits justify the possible risks. The most common are: Cold extremities, muscular fatigue and in isolated cases bradycardia, have been reported. Rarely several sleep troubles, similar to the ones remarked with other -blockers have been reported. Hypertension: Most patients respond to a dose of 100 mg in a daily single intake. Some of them can be supported with a dose of 50 mg once a day. The evaluation of the response must only be done after 1 or 2 weeks of continuous treatment. Angina pectoris: The effective dose is generally of 100 mg daily, in only 1 or 2 intakes. Efficacy is not generally increased if this dose is exceeded. Arrhythmies: After the initial treatment with Atenolol IV, a therapy of support with 50 or 100 mg of Atenolol, oral way in a single dose may be fixed. From the first moment, excessive bradycardia may be counteracted by atropine, 1-2 mg IV, followed if necessary, by a -stimulant such as isoprenaline (25 mg) or orciprenaline (0.5 mg) administered in slow IV injection. In case of an adrenergic must continue to be administered, care must be taken that blood pressure does not fall excessively. Glucagon (10 mg IV way) has also been used as cardiac stimulant.